Anita and Jerry on the Norwegian Cruise Ship: Pride of America, October, 2013. 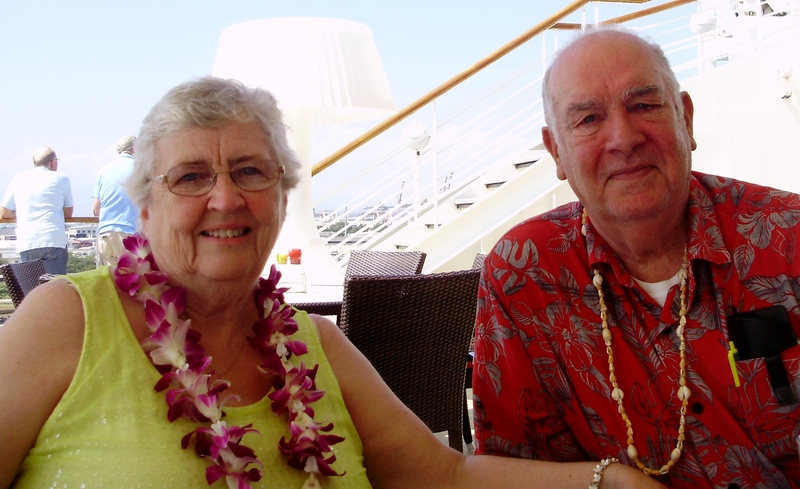 We were cruising to four of the Hawaiian Islands with our daughter and son-in-law, Pam and Gene, and a cousin, Kay! I’m a person who loves to write. This isn’t my first blog but it is my latest blog. I’m a housewife who is aging. I’ve been married to my wonderful, loving, patient husband for 59 years now! Together we raised 5 beautiful children, three boys and two girls. They have now given us 15 beautiful grandchildren, eight grandsons and seven granddaughters, plus a great-grandson! We, also, have two granddaughters-in-law! I love to travel and have been to all 50 states with my husband. We’ve also been to five continents and thirteen countries. Two of the thirteen, Japan and Thailand, I was alone but Jerry was with me in spirit! I write a newsletter, which comes out every other week, for prime time folks. Thus, the name of it is Prime Time News! To learn more about me you’ll have to read allinadayofme.com By the way, I love comments and likes! I love Jerry with all my heart but the very first love of both of us is Jesus Christ. He reigns supremely in our lives, in our marriage and in our home. Thanks for commenting. Spam is automatically taken off mine so I don’t have a problem with it. Thanks foor posting when you’ve got the opportunity, Guess I’ll just book mark this blog. Hi there, every time i used to check blog posts here early in the morning, for the reason that i love to learn more and more. I feel that iss one of the such a lot vital info for me. And i’m satisfied readig your article. However should observation on some basic things, The web site taste is perfect, the articles is truly excellent : D.
Hi, Anita. I checked into your blog to make sure I have not missed any of your posts, and it looks like I haven’t, a good thing. I have been having a terrible time with my website transfer and hope you have not been dropped from my list of subscribers. Happy Sunday to both you and Jerry! Hi Marian! Well I’m back and I hope to stay. But so much has changed with blogging, I’m rather confused!